This section of the trip was simple, but hard. The simple part was getting from point A to point B. The harder part was coordinating with the other members of the expedition, friends and family. We left Tucson and went to visit our long time friends Rick and Kim in Chandler. 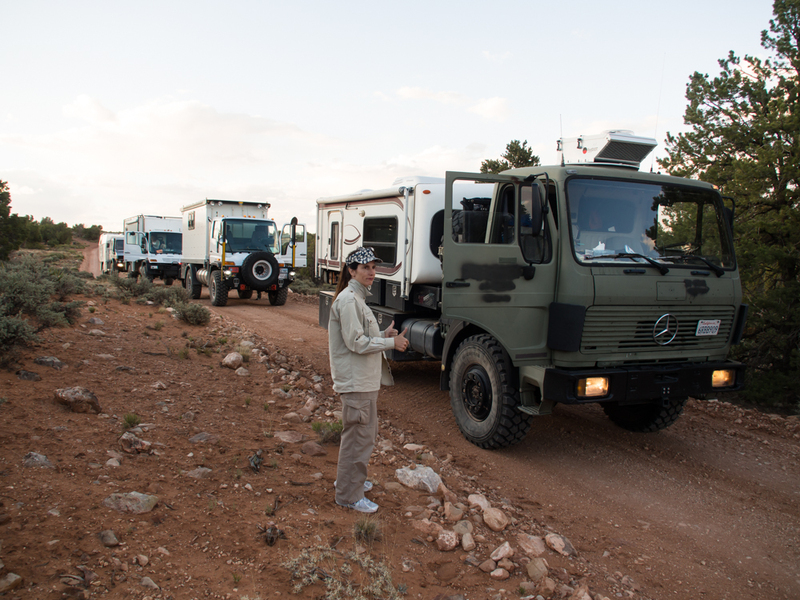 After a delightful night, we hit the road again and headed north toward Flagstaff to rendezvous with the Overland Expo crowd. But, the U500 group made a decision overnight to change the schedule. So, we had to coordinate the changes via cell and text messages. 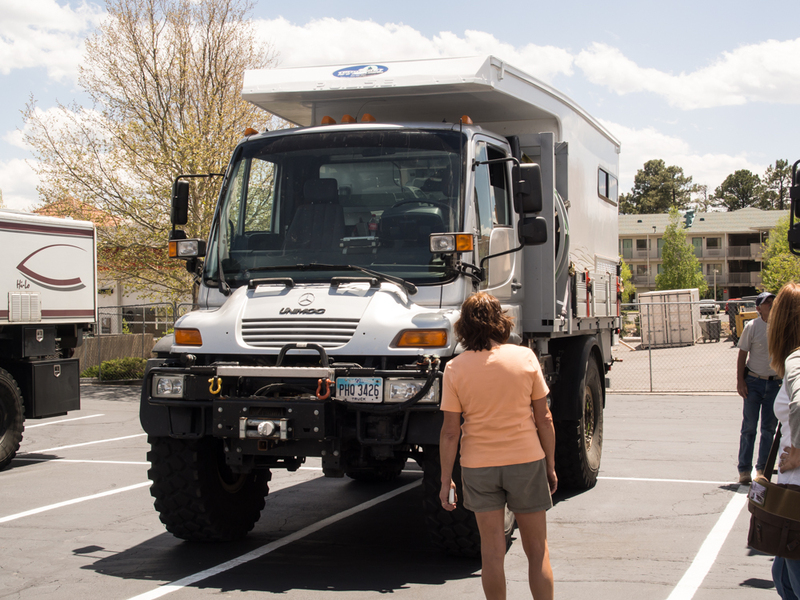 We were able to accommodate to the real-time changes and meet the group in Flagstaff. 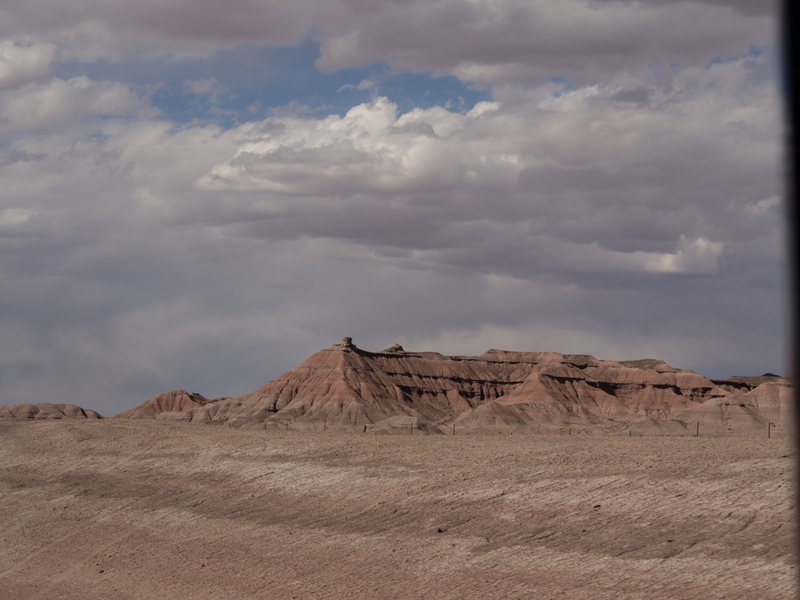 After food for the humans and food for the trucks, we headed north toward Marble Canyon. 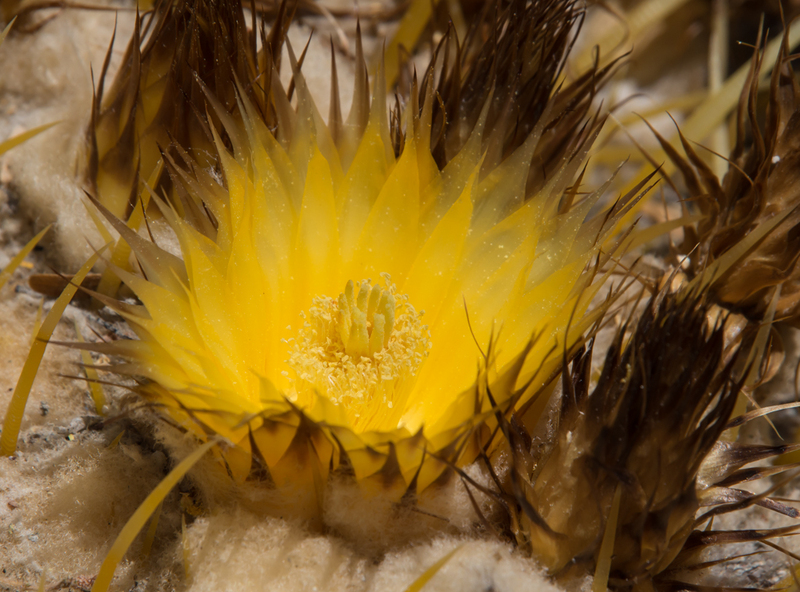 Before we left the parent's place in Tucson, I got this photo of one of the barrel cactus in the yard with blooms. We traveled to Chandler and met our long-time friends Rick and Kim and stayed overnight at their awesome home. Next morning, we headed north to Flagstaff and finally met the balance of our group at the Walmart in Flagstaff. 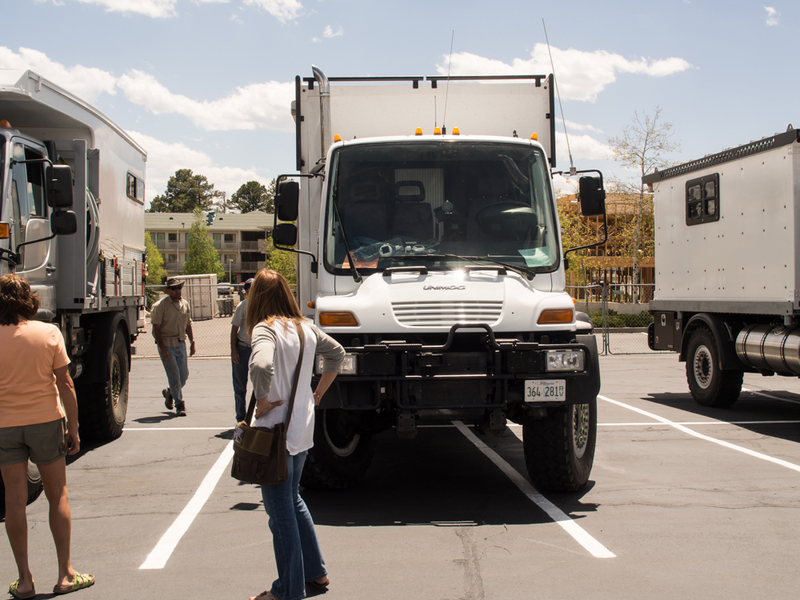 We had to do a parking lot line-up for benefit of the local shoppers; there were plenty of craned necks checking out the trucks. 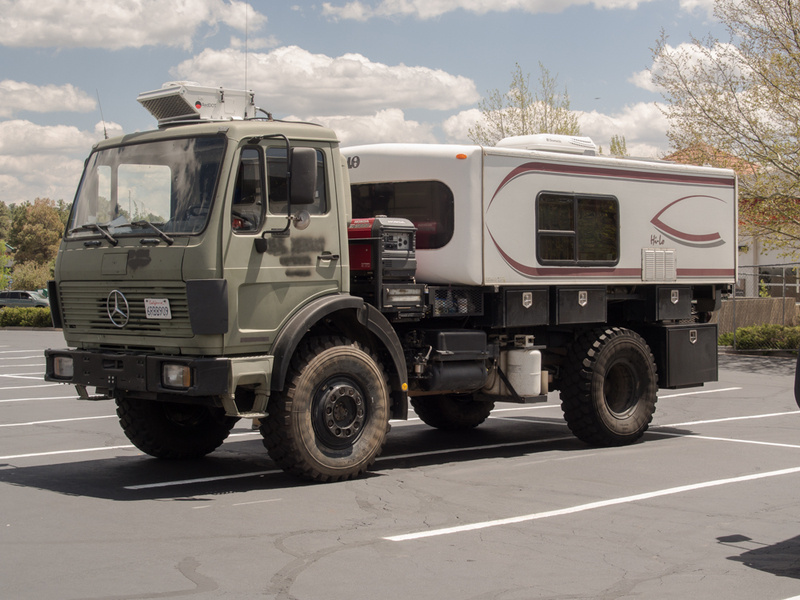 This is Chris and Anne's U500 camper with pop-top roof. 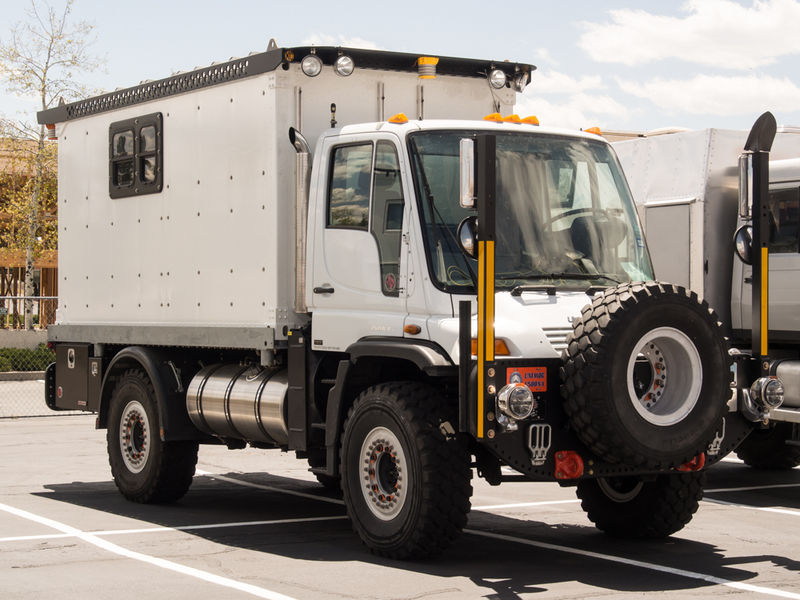 Mark and Gail's Global Expedition Vehicle (GVX) U500. 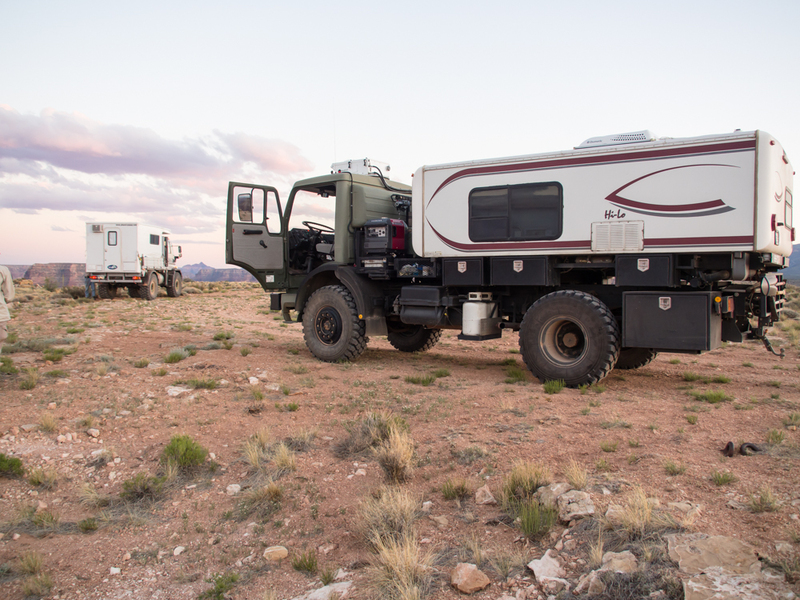 Vince's home-brew U500 camper with ex-mil command shelter as the camper box. 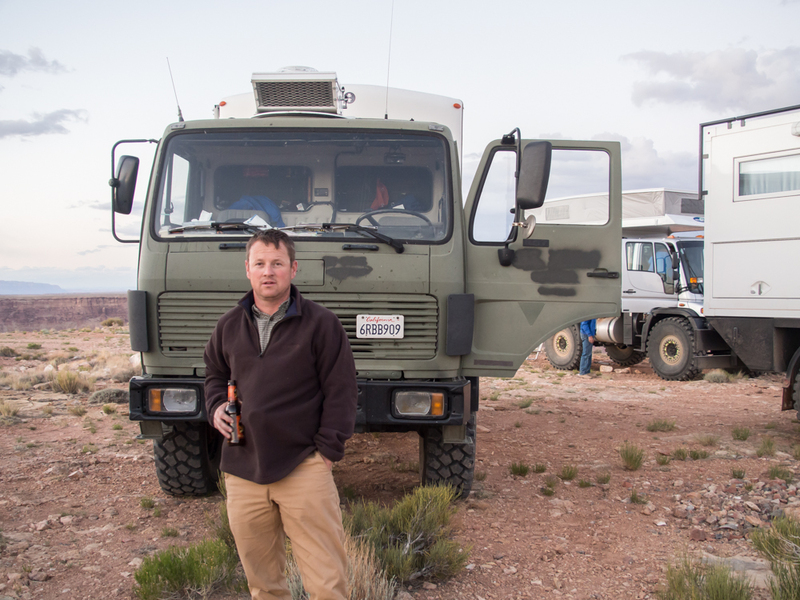 After food for the trucks and humans, we headed north on US89 toward Page, AZ. 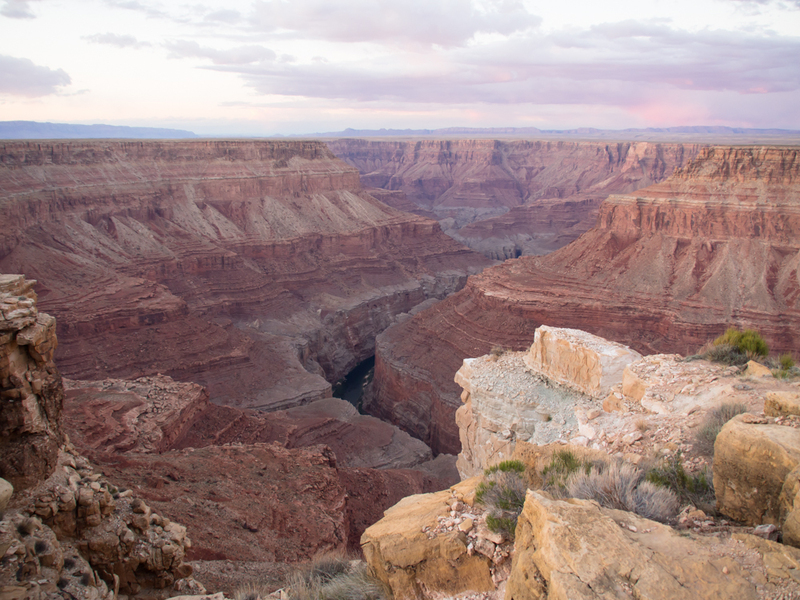 Our plan was to go to a camp site that was on the lip of the Colorado River in Marble Canyon and spend the night. 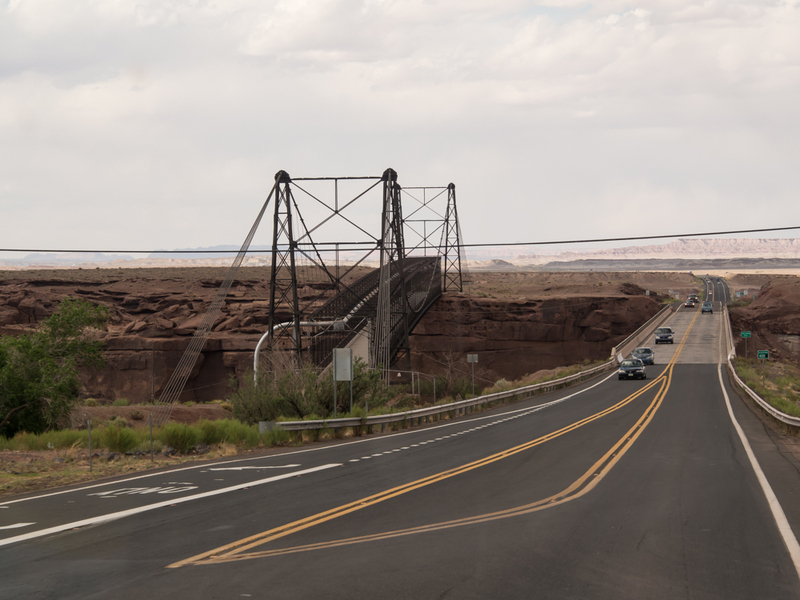 Above is a photo of the old bridge that spans the Little Colorado River on the Navajo Reservation. 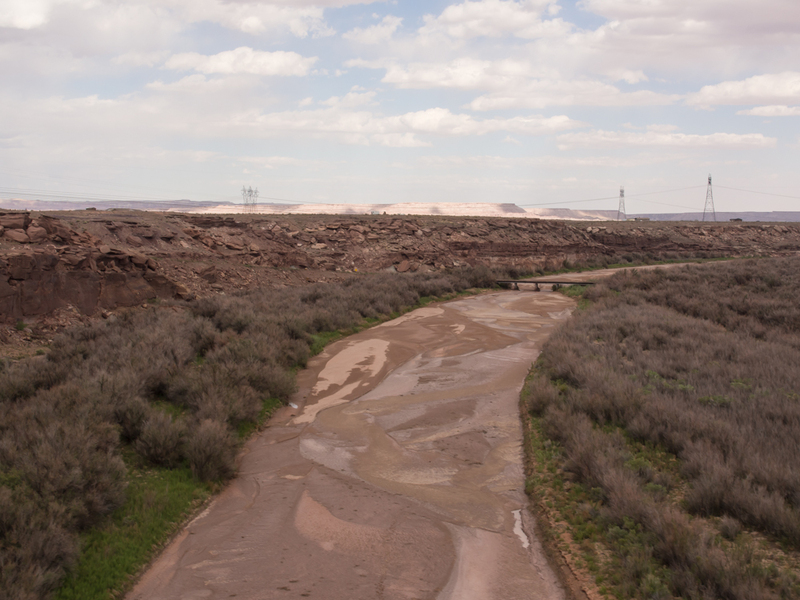 There was just a little water in the Little Colorado river bed but a few days prior it had been running hard due to spring rains in the high country. 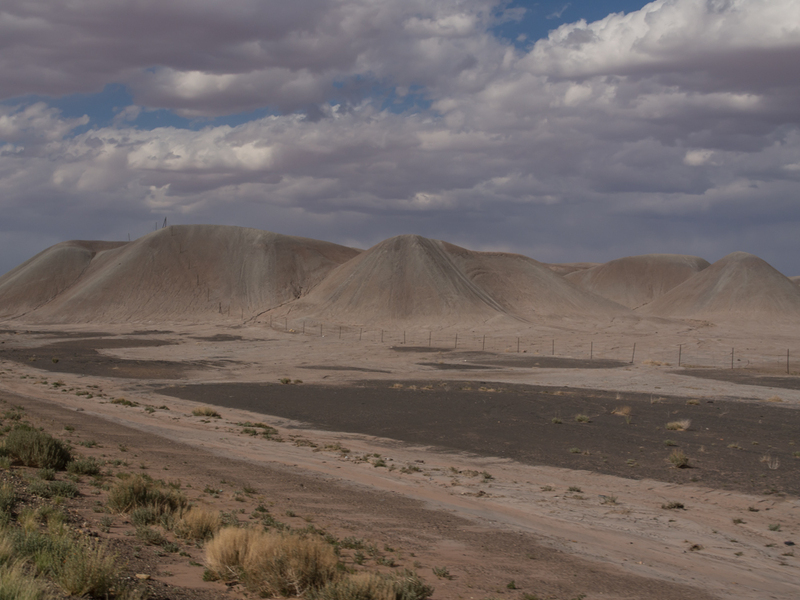 Further north we came to the gray mud hills that are formed by the Moenkopi formation. Interesting erosion patterns were formed in the mud hills. As we gained elevation, the type of formations changed as well. 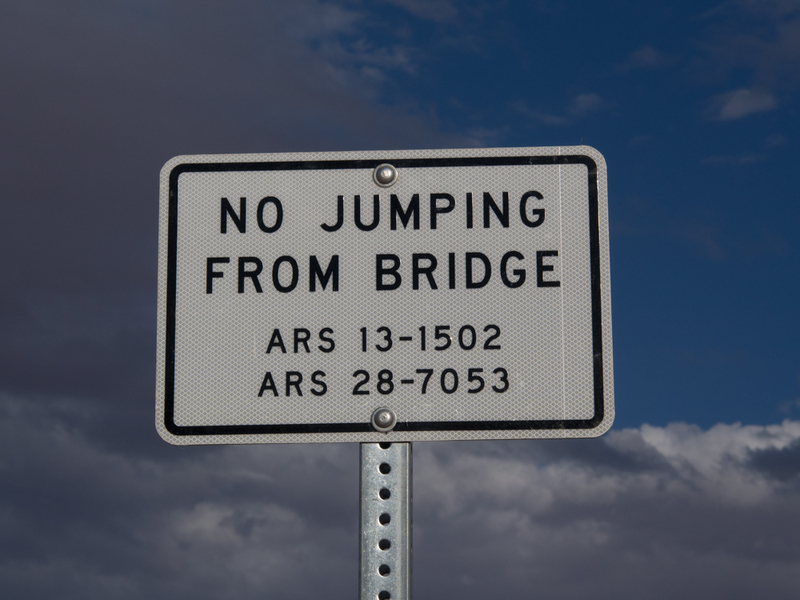 I was shocked to see this sign on a bridge that crosses the Colorado River in Marble Canyon. Not because of the intent of the sign, but rather the uselessness of it. 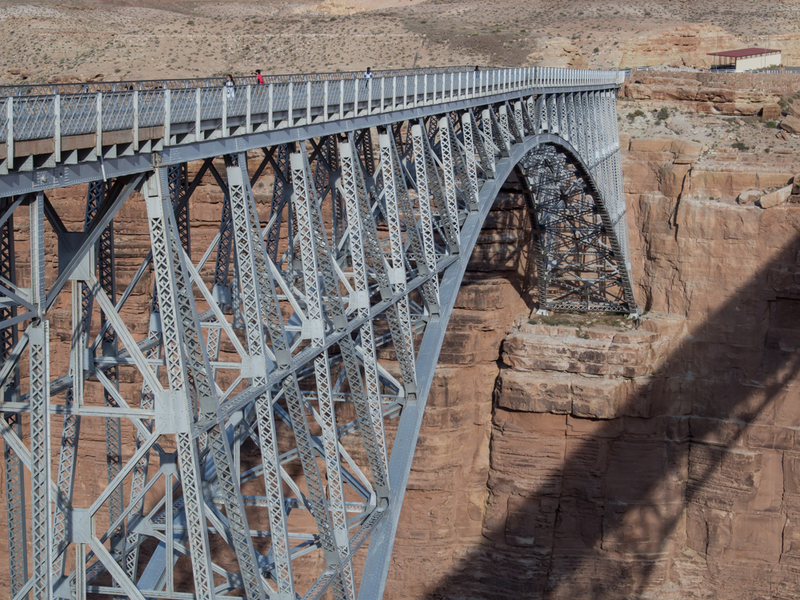 The bridge is over 400 feet from the surface of the river, so jumping is out of the question for a normal person. And, if the intention was to commit suicide, then the person won't care about the sign anyway. 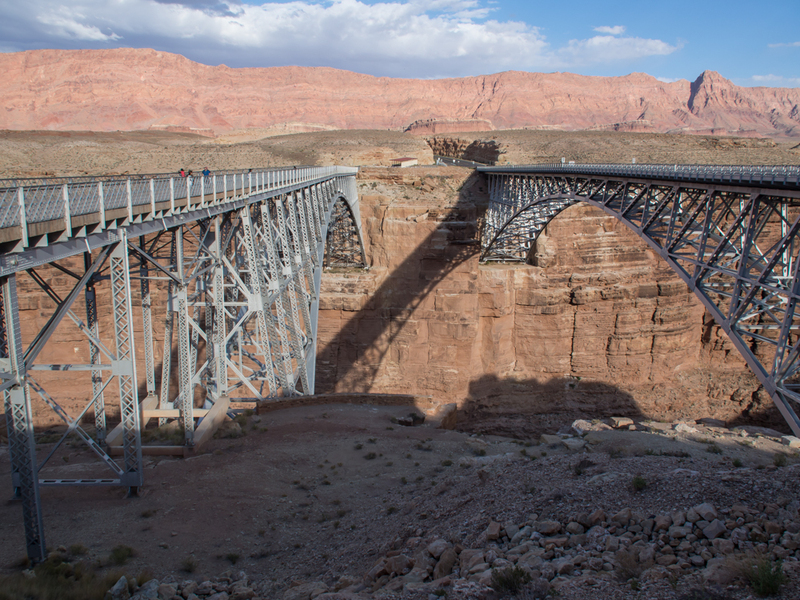 The new bridge on US89 is an engineering marvel. 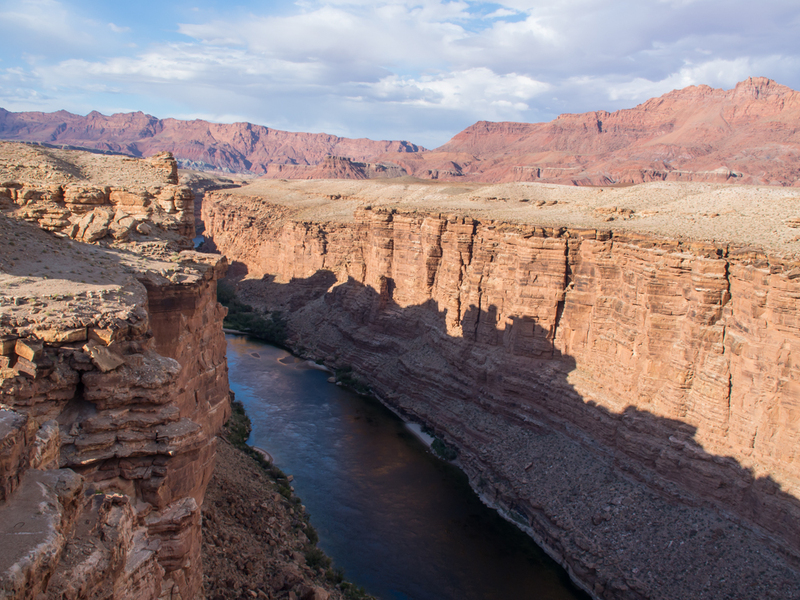 The mighty Colorado River, tamed in the 1960s by the Glen Canyon Dam, provides an awesome sight at the bottom of the 400 foot gorge. 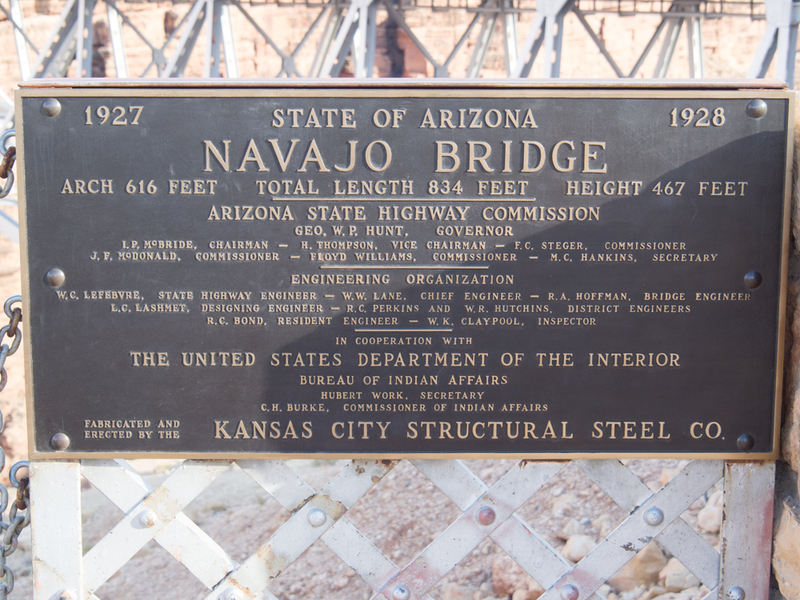 The sign gives the stats on the original bridge. The old bridge is on the left, the new on the right. The old bridge is open to foot traffic and photos. 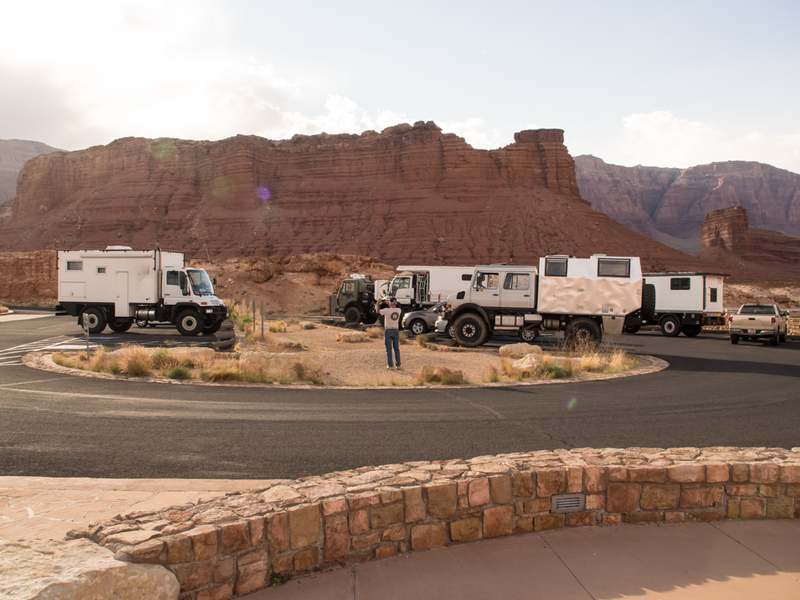 It was getting late in the day, so after a bio-break at the overlook point, we headed out toward the Marble Canyon campsite. A better view of the old bridge. This was constructed out of hand riveted steel. 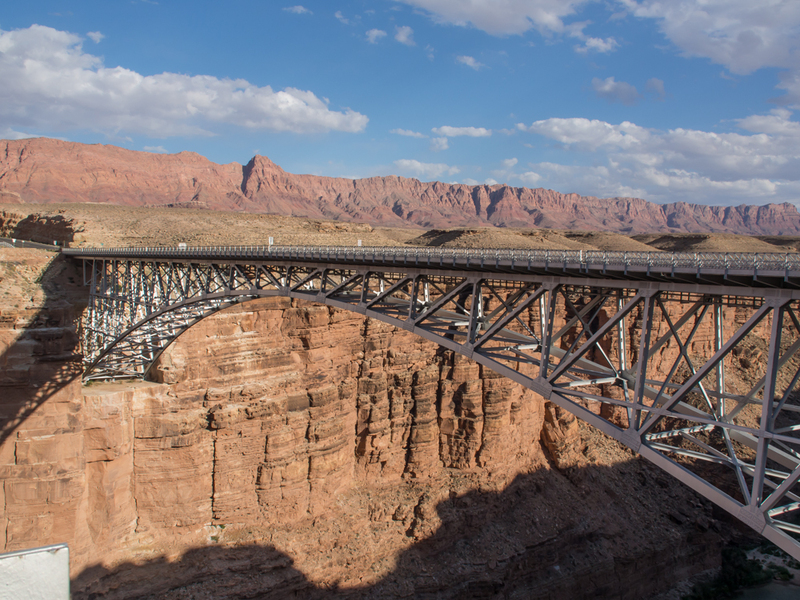 To get to our Marble Canyon overlook, we had about 30 miles of dirt. The road had been recently graded, but we could only go about 25 mph on most of the parts. Above we do a road-side stop to insure that the group is together. We finally arrived at the overlook camp site and it was better than expected. While a bit breezy, the view was off-the-chart, even in the waning daylight. The Colorado River at the bottom of Marble Canyon was clearly visible in the deepening shadows. 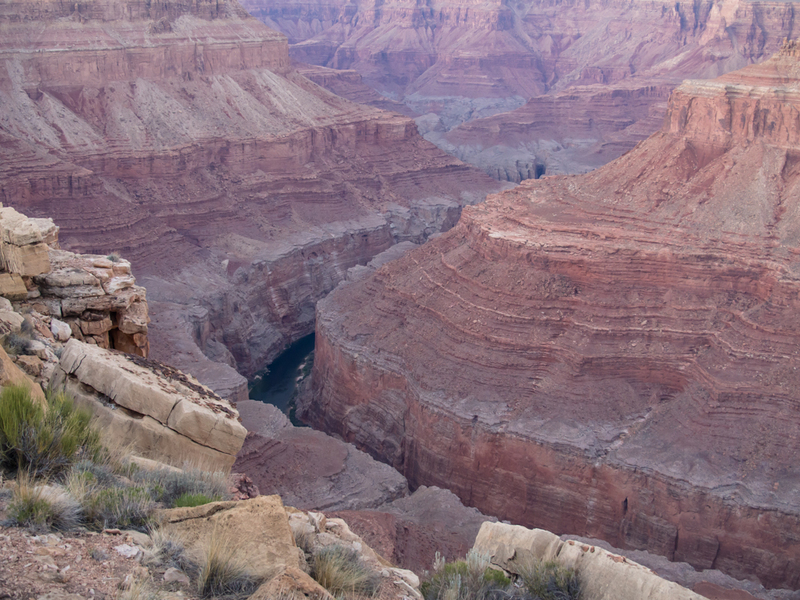 Our camp was just feet from the lip of the chasm on the end of a point that gave us a 180 degree view of the main river channel and its side canyons. 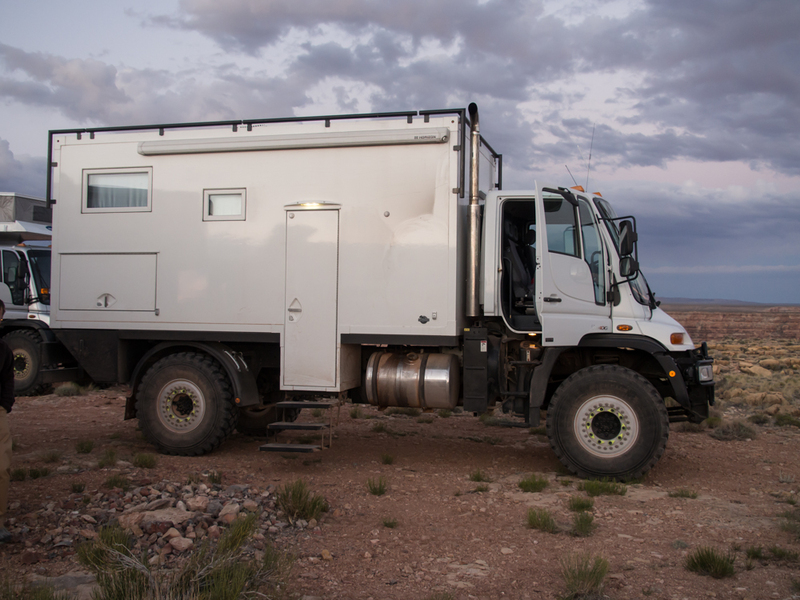 Above is a photo of Thor, our 1017A-based camper before the top was raised. Rob gets his evening beer ration. This section of the trip went well. To be sure, coordinating large groups via cell phones and text messages is hard, particularly when the service level is intermittent. If you travel to this area, be sure to know your fuel requirements. Fuel stops are few and far between and some of the back country service stations charge a premium price for their fuel. 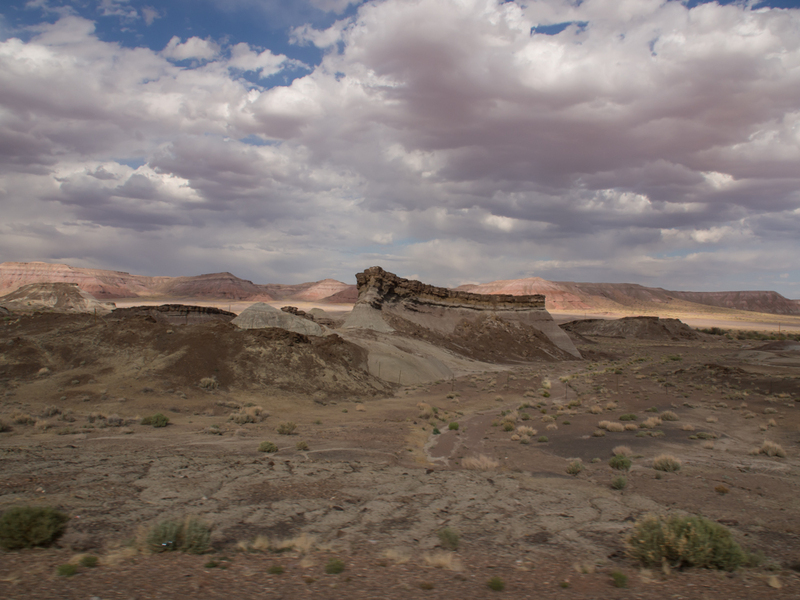 Tomorrow, we head toward Big Water, UT and into the Grand Staircase National Monument.